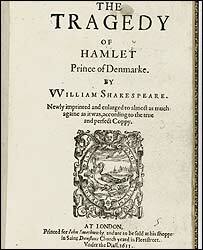 A rare copy of William Shakespeare's Hamlet has failed to sell at an auction in New York. The edition, printed in 1611, had been expected to fetch up to $2m (£1.09m). Printed during the writer's lifetime, it is the earliest available version held by a private collector and was for sale as part of an auction of the Estate of Mary, Viscountess Eccles. "We might have been optimistic," said Francis Wahlgren, heads of Christie's book department. Lady Eccles, who died in 2003, assembled her collection over 60 years at her Four Oaks Farm in New Jersey. Christie's described it as "one of the most exceptional private collections of the past century". Along with first husband David F Hyde, she began collecting 17th Century books before expanding the collection to include the 18th Century. Her extensive Samuel Johnson collection is now at the Houghton Library at Harvard University. The world record for both a Shakespeare and 17th Century book was set in 2001, when a first edition Hamlet sold for £3.4m. Christie's found buyers for 98% of the books and manuscripts from her estate, which included 10 other Shakespeare quartos. "The bidding actually was excellent - all but on one lot," Wahlgren said. The third quarto - the final edition published during the Bard's lifetime - has been described as the "gold standard" of Shakespearean texts by Michael Boyd, artistic director of the Royal Shakespeare Company.